What Fits In A 10 x 10? Let’s see if your items fit in a 10×10! 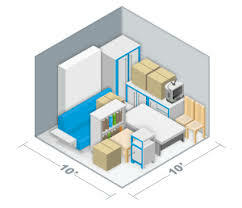 A 10×10 self storage unit is 100 square feet. For a visual, we compare to a small guest bedroom, or even a small kitchen. Take a tape measure out and see what this looks like in your home. The ceiling height is 9ft, which allows plenty of space for stacking boxes and totes. A one-bedroom apartment could potentially fit into a 10×10 (if packed correctly) This would be a bed, box spring, bed frame, dresser, side tables, living room furniture, a small dining room table and chairs, kitchen items, and miscellaneous boxes or totes of household items like clothing, towels, and accessories. Another use for a 10×10 is storing patio furniture, seasonal yard items, christmas and holiday decorations. We have had customers use a 10×10 when renovating a portion of their home, to keep items away from dust debris and construction hazards. Our 10×10 traditional unit (not heated, not cooled) is $107 per month. Our climate controlled 10×10 unit is $125 on the first floor and $115 on the second floor. Stop in for a tour, we are here to assist you!